The beauty and strength of kudzu was not lost on me when I first moved to Harlan Co., Ky. as a child. At the bottom of the mountain where we lived was a no-name convenience store. From its parking lot, I could toss my head back and see the skyscraper-high trees covered with long braids of Kudzu. An inescapable skulking vine—I would see it all over the country side, usually green, sometimes sprayed brown with weed killer from a human’s attempt to slow its creepy crawl. The constant silhouette of the leafy ropes was as omnipresent as the steep, overbearing and shadowy hills of Harlan County. 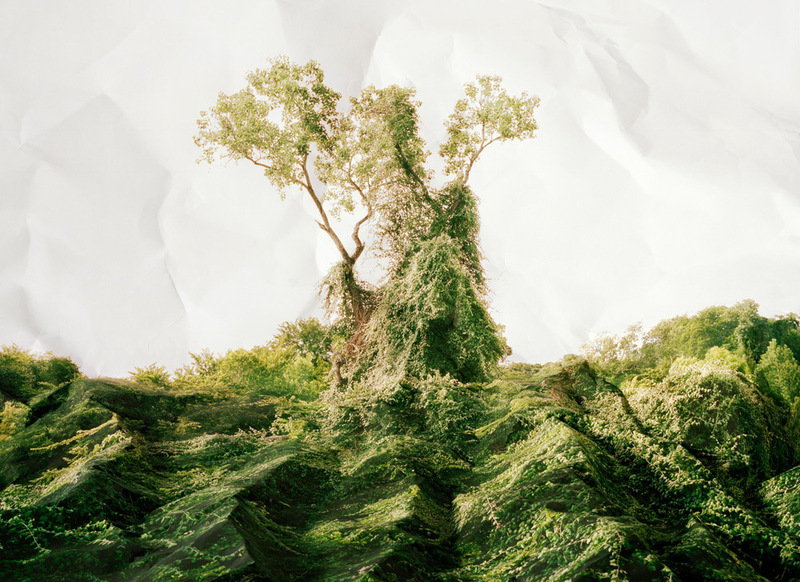 I was also awestruck when I saw Laura Plageman’s photograph, Response to Print of Kudzu, Texas, 2010 available from the Web site, 20×200.com, which sells limited edition art, in easy to frame sizes starting at $20. The dying tree pulls the viewer’s eye center while the leaves skirting the tree’s roots draw attention lower, across the width of the photo. What is more breathtaking, the suffocation of the tree or the expansive life of the undulating waves of leaves growing below? Response to print of Kudzu, Texas, 2010. Image courtesy of Laura Plageman and 20×200. My memories of kudzu, and how it captivated me, faded once I lived in cities east (Washington, D.C.) and northwest (Louisville, Ky.) of the east Kentucky hills of my early childhood, but they are rekindled each time I cross into the foothills. Last fall on a road trip from Louisville to southwestern Virginia, where my parents are from, my drive was shadowed by the wild, untamable kudzu. It had been quelled behind guard rails—trees sacrificed as billboards, easels and marquees, all advertising the brawn of the plant. Each strand kept at bay by vigilant trimming and treatment. But when I first saw the great, green blankets of kudzu last autumn, I gasped, because it was so rampant, so familiar and so breathtaking. The trees, the sun, the shadows and even the kudzu welcomed me. Just as kudzu across a mountain both hides the original and reveals a new, but altered landscape, Plageman’s technique invites inspection of the fabricated scene while enticing viewers to relax into the lush and vivid terrain. The juxtaposition of alluring beauty and quiet discomfort is a familiar feeling to me as an urban Appalachian. I am pulled in to the beauty of more rural Appalachian landscapes to which I feel akin, but I never self-identify as country or small town enough (a regional stereotype with which I compare myself ) to be a true part of the culture. Even though my city life sees very little kudzu slinking under the fence or up the porch on my house, I crave the landscape that hosts a pernicious visitor that overstayed its welcome. The conflict of weed and tree, breathlessness and inhalation, hilly terrain and flat open space are caught in the crumples, tears and layers of Plageman’s response to kudzu. Credit: Image courtesy of Laura Plageman and 20×200. Response to Print of Kudzu, Texas, 2010 by Laura Plageman is available in the following sizes from 20×200.com: 11″x14″ Edition of 250, $60 or $185 framed; 16″x20″ Edition of 50, $240 or $490 framed and 30″x40″ Edition of 10, $1200 or $1725 framed.